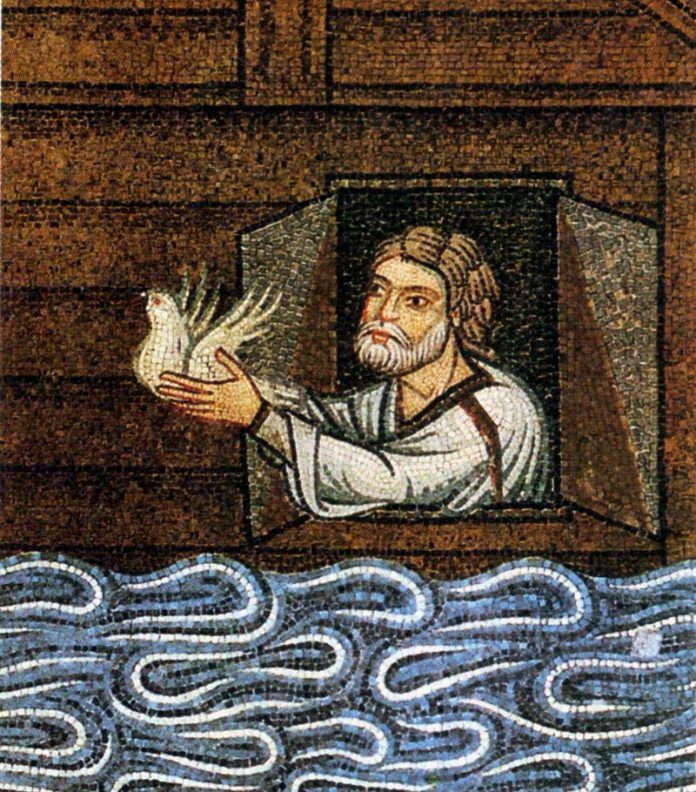 Noah sending the dove. Mosaic from the Saint Mark's Basilica in Venice (XII-XIII century). In the New Testament Gospel of Matthew (24.37-39), Jesus compared the future “end of the age” with the times of Noah. Like Isaiah and Ezekiel in the Old Testament, Noah is treated as an historical figure. Ancient figures such as Noah, however, were rooted in far older mythologies. The Genesis account of Noah and the flood, for example, is predated in several ancient Near East cultures, most notably in the Gilgamesh Epic. What seemed important focused on the event itself: a catastrophic moment in ancient history caused by natural forces that affected emerging civilizations adversely. All ancient cultures connected their environments with deities. The gods brought prosperity and destruction. Civilizations with stable natural environments, like the Egyptians and their reliance on the Nile, tended to develop comfortable and dependable religious traditions. Osiris, who may have originally been an historical figure, emerged as a popular god. Civilizations in the Mesopotamian regions contended with an inhospitable natural environment, including unpredictable river systems. Here religious traditions were more transcendent and the gods less accessible. The story of Noah is tied to a natural event of catastrophic proportions. Bruce Auster (U.S. News & World Report, November 29, 1999) writes that “Scientists have discovered new evidence that a deluge inundated the Black Sea basin some 7,500 years ago, wiping out entire cities…” This ancient coastline was 550 feet beneath the Black Sea surface. These facts support a similar theory advanced in the 1999 book Noah’s Flood by Columbia University scientists William Ryan and Walter Pitman. Although the gods brought destruction, people blamed themselves for the calamities; somehow the gods had been offended. Old Testament prophets like Jeremiah warned the people to change their ways or they would be destroyed. The children of Israel displeased God and wandered in the desert for forty years. In ancient Carthage, a defeat at the hands of Syracuse led to the sacrifice of the best children to Cronus (Ba’al Hammon) to appease the god. Oral tradition passed stories of a great past upheaval from one generation to the next. Eventually, these were recorded as stories focused on man’s relationship to the gods. In this sense, flood stories highlighting the worst case scenarios of destruction used religion to control behavior and remind man of his own mortality.